Campbell Soup (CPB) reported a loss in its fiscal fourth quarter Thursday, driven down in part by a slowing in U.S. soup sales, despite efforts to attract weight- and health-conscious consumers with a steadily increasing slate of healthier offerings. For eight quarters, the formula had been working, but the bottom clearly fell out in the three months ending July 28, with growth in soup sales easing to 4 percent, down from 14 percent in the last quarter. The slowdown may be weather related -- demand for soup falls in the summer, after all. But consumers may also be worried that Campbell's Soup perhaps isn't good food. A big part of Campbell's rising success has been their Healthy Request line, a collection of soups that promise to be much healthier than the usual offerings -- and which have the American Heart Association's heart-check mark to back up the claim. When it came to developing healthier soups, fat was obviously an issue, but sodium was the real bugaboo. Salt, after all, is the dark side of the broth: a highly effective flavor enhancer, it also happens to be far cheaper than vinegar, spices, and other premium ingredients. The trouble is, for health-minded consumers, especially Baby Boomers, salt doesn't just boost flavor -- it also drives up blood pressure. To sell its offerings as heart healthy, Campbell needed to cut the sodium. In its Healthy Request line, Campbell managed to get sodium down to 410 mg per serving, less than half the level of its standard offerings. For customers in search of a health-conscious food at a low price, the new soups seemed almost perfect. The trouble is, while 410 mg per serving makes the Healthy Request line a healthier alternative to regular soups, it hardly qualifies the soups as healthy. On a salt-to-calories basis, they are still pretty seriously out of balance. To understand this, it helps to imagine a health-conscious consumer who chose to go on a Healthy Request-based diet. Picture a person who ate three bowls of soup a day -- one for breakfast, one for lunch, and one for dinner: He or she would take in 1,230 mg of sodium, a number that falls well within the Center for Disease Control's guidelines for a healthy diet. The trouble is, he or she would also be taking in between 180 and 420 calories per day -- basically, a starvation diet. To get up to a normal daily intake of 2,000 calories, the Campbell's soup dieter would need to consume more than fourteen bowls of Healthy Request Grilled Chicken and Sausage Gumbo, which would come with 5,857 mg of sodium. That's more than twice the upper limit that the CDC sets as "likely to cause no risk of adverse health effects." 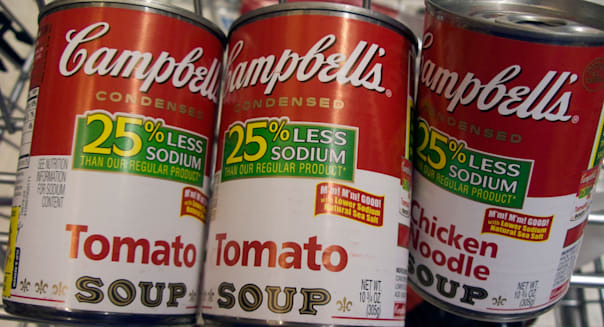 This apparent inconsistency hasn't escaped the notice of customers: Earlier this month, New Jersey resident Kerry O'Shea launched a proposed class-action lawsuit against Campbell for misrepresenting the health benefits of its soups. If the suit gathers steam, it could short-circuit Campbell's current growth strategy -- in addition to providing a useful lesson to consumers about the dangers of relying too much on endorsements from the American Heart Association. In the South Pacific, where it grows naturally, kava kava is a popular sedative that often shows up in religious and social rituals. Yogi Tea's "Calming" blend mixes the herb with lemongrass, chamomile and gotu kola to produce a tasty, mildly sedative brew. If you're having a difficult time adjusting your sleep cycle to daylight savings, or just can't quite get to sleep, it's a delicious, healthy alternative to sleeping pills, melatonin, or other over-the-counter sleep aids. Numerous studies have suggested that zinc boosts the immune system, and that supplements, taken at the beginning of a cold, can help reduce its duration. Concerns still persist that zinc-based nasal sprays can permanently damage a cold sufferer's sense of smell, but zinc lozenges, placed under the tongue, remain a safe and effective supplement. Best of all, many retailers offer them for under $2! For anybody who spends a lot of time in sunlight, vitamin D isn't a problem. In fact, according to WebMD, six days of casual sunlight exposure without sunscreen will pretty much do it. Even so, huge portions of the country, particularly in the north, are vitamin D deficient. In addition to contributing to seasonal affective disorder, the lack of vitamin D can cause immune problems, skin problems, osteoporosis, and a host of other problems. Luckily, supplements start at about $2 per bottle. While it doesn't seem to have much affect on the immune system, fish oil is a must-have when it comes to general health. Often cited for its affect on high blood pressure, its effectiveness in reducing heart attacks and strokes, and its general benefits for cardiovascular wellness, fish oil is cheap, convenient and easy to find. Admittedly, the best fish oils tend to cost a bit more, but entry-level brands generally run $3 or less. If you watch The Office, you might remember the secret Santa episode, in which Dwight announced his plans to use Jim's gift to Pam to clear out his sinuses. While the notion of nasal irrigation is a little uncomfortable (yes, the end of the little teapot really DOES go in your nostril! ), doctors widely acknowledge that it's a great treatment for sinus problems associated with allergies and colds. An entry-level model costs just under $4.